The U.S. stands as the most attractive place to set up a payments business but the U.K. has made significant gains in landing such entrepreneurial efforts, according to a new report from the Emerging Payments Association. 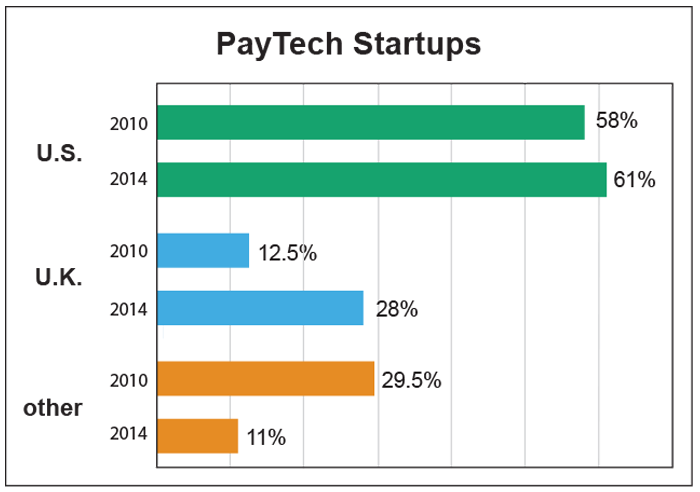 In its “Investments in PayTech” report, the U.K.-based trade group, in association with The Bancorp, found that 61 percent of payment startups launched in the U.S. in 2014, 28 percent in the U.K. and 11 percent elsewhere. Compared with 2010, the U.S. base remained stable: 58 percent of new payments operations launched in that country. But the U.K. showed significant growth compared with 2010, when the country attracted 12.5 percent of startups, with 29.5 percent of those companies locating in other countries. Some 2,000 fintech companies now call the U.K. home, up from about 800 in April 2015, the report said. When it comes to seed funding for startups, the U.K. and its former colony have reached virtual parity, the report said: Fintech seed funding in the U.S. averaged $1.9 million per instance in 2014, compared with $1.8 million in the U.K. The report also suggested that fledgling fintech firms in the U.K. remain independent longer than do their peers in the U.S.—of the companies established in 2010 in the U.S., 43 percent have closed or been acquired. Of similar companies in the U.K., 100 percent remain “independently active,” the report said. In related news, challenger banks seeking to disrupt traditional financial institutions through fintech continue to pop up in the U.K. Regional U.K. financial institutions Clydesdale and Yorkshire banks said today they’re launching a mobile-only bank called B. Customers using B will use an app to make payments and maintain checking and savings accounts. The app will be free for the first year and then cost £2 (US$3) per month. “B represents a challenge to other banks and is based around an app that has been extensively tested,” said Helen Page, customer experience director at Clydesdale Bank and Yorkshire Bank.